During summertime, the air smells like sunscreen. The sky is vibrant and bright until long after dinner. And a sip of ice cold lemonade feels just as restorative as a full body massage. Why? Lemonade – or any cool liquid, for that matter – does not gain mystical healing powers in the summer. Summer is, however, a time for blistering heat and outdoor activities, a combination that can lead to nasty dehydration if a person does not take the right precautions. Dehydration does not only cause thirst – it can slow people’s thoughts down to a crawl. In fact, the cognitive effects of dehydration can be so strong that they can worsen – or even mimic – mood disorders. It’s no wonder that dehydration has such a profound effect on the human body – humans are, after all, roughly 60 percent water. Any change in that water content, no matter how slight, can throw a person’s entire system out of whack. Mild dehydration is marked by only a 1.5 percent change in water level. Thirst receptors, meanwhile, don’t start detecting a problem until a person is between 1 and 2 percent dehydrated. This means that a person can be dehydrated and not even realize it. Dehydration symptoms include headaches, reduced muscle control, exhaustion and slow thoughts. Although some of these symptoms seem like mild inconveniences at the worst, they can actually cause profound issues with cognition, behavior and mood. A recent study published in the medical journal Physiology and Behavior found that people who drive while dehydrated are just as impaired as people who drive drunk. Another set of studies found that both men and women who were mildly dehydrated suffered a decrease in mood and an increase in fatigue, tension, anxiety and difficulty concentrating. 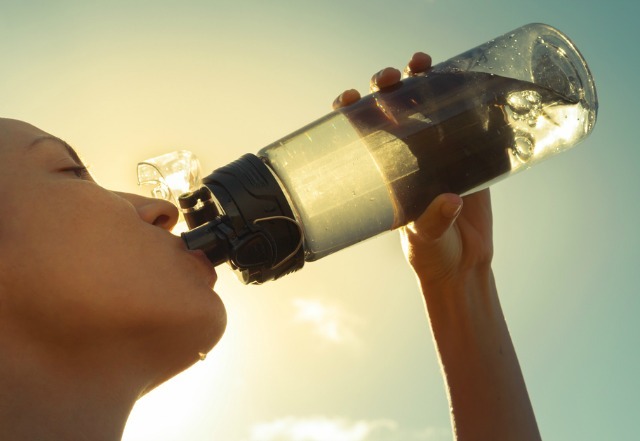 Mild dehydration doesn’t just hit people who are in the middle of a marathon. Even the most sedentary people gradually lose water – and thereby cognitive ability – as the day goes on. Thirst isn’t always an accurate measure of dehydration, so how can people tell whether they need water or not? One test to measure dehydration is called the skin test. To perform the skin test, people should pinch the skin on the back of their hand and pull it upward. If the skin stays elevated for more than several seconds, they are likely dehydrated. Another way for people to test for dehydration is to examine the color of their urine. Clear or light yellow urine suggests proper hydration. When people see that their urine is darker than usual, e.g., bright yellow or orange, they should drink a couple glasses of water. Other signs of dehydration include swollen fingers, dry skin, sluggish thoughts and heart palpitations. The best defense for dehydration is a good offense. Rather than waiting for dehydration symptoms to emerge, people should drink water as frequently as possible regardless of whether or not they feel thirsty. Some people find that keeping a water bottle next to their desk helps them stay hydrated throughout the day. Eating plenty of fruit is another way to avoid dehydration. Hydration may not seem like a big deal, but it can make all the difference. Dehydration can be the difference between a good day and a bad one, or the difference between a successful commute and a car accident. Keep that water bottle handy, especially during the long summer months. Sovereign Health Group provides patients with a comprehensive brain wellness program that teaches sleep hygiene, healthy eating habits and how to best stay hydrated. For further information, please contact 888-530-4614.